Born Henry Fredericks, Taj Mahal's blues rock career had its peak in the late sixties/early seventies. His blues is played very much in a solid rock style - big and powerful, with classic rock drum backing, harmonica and Mahal's knife through butter blues guitar. This is an excellent compilation of some of his best recordings from that period. The sound quality is very impressive throughout. There is a wonderful, refreshing purity to the blues on here. If you love proper blues rock, you will love this. 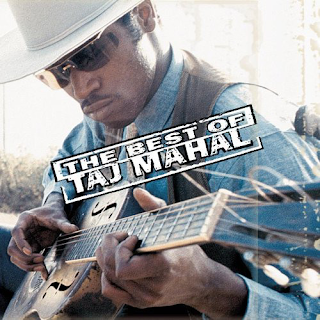 Taj Mahal liked to rock 'n' roll too, plus he enjoyed a bit of country stuff. There is all sorts included on this fine album. "Statesboro Blues" is an absolutely barnstorming slab of rousing blues rock, jammed full of searing guitar and a great vocal. "Leaving Trunk" is a huge, muscular piece of chugging rock. So powerful. What a bass line on it too. The recognisable "Corinna Corinna" has been covered by many artists, notably Bob Dylan, The Rolling Stones and Albert King. King also covered the shuffling, funky "She Caught The Katy And Left Me A Mule To Ride". The "katy" was the Kansas to Texas railroad. "Going Up To The Country, Paint My Mailbox Blue" is another track that is just so strong, such pure blues rock. Beautiful. "Take A Giant Step" has Mahal going soulful in his vocal and a bit country in the backing. It is quite upbeat and different to the stomping blues rock of what we have heard so far, showing Mahal's versatility. This also applies to the country-ish rock 'n' roll of the incredibly catchy "Six Days On The Road". This one really rocks. "Farther On Down The Road" is deliciously soulful, with a Stax-esque, Memphis soul feeling about its groove. 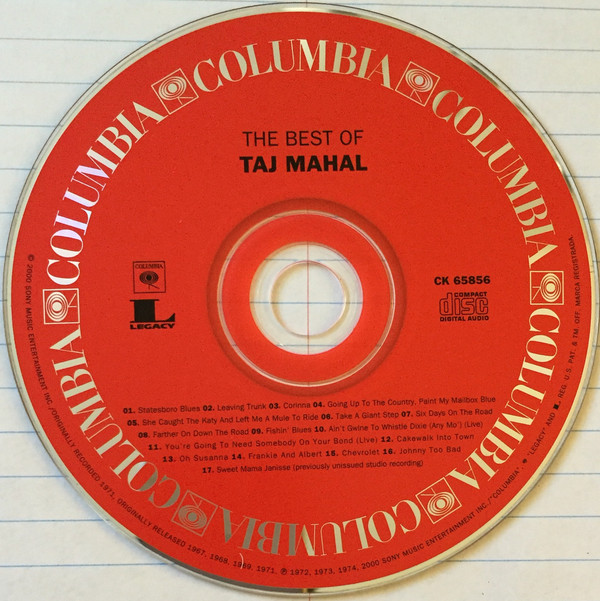 Mahal had an excellent soul voice. "Fishin' Blues" is the album's first conventional, rural-sounding vocal and acoustic guitar blues. "Ain't Gwine To Whistle Dixie (No Mo')" is a live recording of an instrumental featuring flute and a soulful brass backing. A saxophone solo also crops up to add to the difference in sound to this one. The rocking blues returns with the lively "You're Going To Need Somebody On Your Bond". "Cakewalk Into Town" is a jaunty, fun blues backed by what sounds like a tuba. "Oh Susanna" is given a funky, vaguely reggae-ish makeover. "Frankie And Albert" is a folky blues also covered by Bob Dylan on "Good As I Been To You". "Chevrolet" is a funky number, while "Johnny Too Bad" is a cover of The Slickers' reggae early seventies reggae hit. It begins with a gentle acoustic guitar before an authentic thumping reggae groove kicks in and we get maybe the first example of blues reggae. I love this. "Sweet Mama Janisse" is a fine traditional blues to finish off this highly recommended, fantastic-sounding compilation. A most enjoyable, invigorating listen.